IFS, KI/Pallas and Dixie Contract Carpet collaborated on a Healthcare focus happy hour event held at Aloft hotel in Tapestry Park Jacksonville, FL on August 18, 2011. The party included displays of the latest in hospitality products in flooring, furniture and fabrics. Dixie Contract Carpet, Inc. is starting the largest carpet installation in Florida! Dixie Contract Carpet, Inc is beginning the installation of the largest carpet project in Florida. This project entails 54,000 yards of custom broadloom carpet that will begin installation this month. The six story Duval County Courthouse is planned for completion in the summer of 2012. When specifying tile, consider thicknesses carefully! 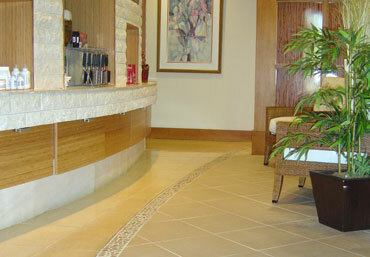 We recently worked on a job where there was carpet set into a ceramic tile border. We assumed the original tile was a typical 3/8” thickness. We brought in a tile that was listed as 3/8” thickness. When it came in it was too thick! Dixie Contract Carpet hosted “DCCU” Dixie Contract Carpet University – a full day of CEU courses focused on flooring for all architects and interior designers. The event was held at the Schultz Center for learning http://www.schultzcenter.org and was attended by 50 design professionals. Dixie Contract Carpet collaborated with industry manufacturers to bring 12 CEU accredited presentations to the event. Dixie Contract Carpet was awarded two top sub-contractor awards at this year’s 2010 Associated Builders And Contractors (ABC) awards banquet in August. The awards were “Excellence in Construction Award of Merit” for the Osprey Fountains UNF Dormatory project in Jacksonville, Florida and “Excellence in Construction Award of Excellence” for the Baptist Nassau project in Fernandina Beach, Florida. We also won “Sub-Contractor of the Year” from ABC in 2009. Thursday, December 16th 2010 Sam and I attended the first annual AIA, IIDA, ASLA and USGBC Holiday Party. The event was held at The Mansion on Forsyth in Savannah, Georgia. There were LOTS of people there – we heard 200 were expected from the front desk clerk. Hi! I’m Maryanne Hewitt and I am Director of Business Development for Dixie Contract Carpet. Sam Jacobson (Vice President) and I created the position of “A&D Marketing” to support the efforts of the design community in flooring specifications back in 2001. I had a degree in Interior Design and had worked for an office furniture dealership and for HOK (the largest architectural firm in the world at the time) in Tampa, Florida. Hello! Welcome to the Dixie Contract Carpet blog! Dixie Contract Carpet is a full service commercial flooring dealership based in Jacksonville, Florida. We have just celebrated 50 years of business in the Jacksonville area and are excited about what the next 50 years will bring!